Home > The Penobscot is open! River restoration proponents are celebrating the completion of the construction phase of the Penobscot River Restoration Project, one of the largest, most innovative river restoration projects in history. In an unprecedented collaboration, the Penobscot Indian Nation, seven conservation groups including Trout Unlimited, hydropower companies PPL Corporation and Black Bear Hydro, LLC, and state and federal agencies, are working together to restore Atlantic salmon and 10 other species of sea-run fish to the Penobscot River. The project features two dam removals and recent completion of a fish bypass at the Howland Dam, where partners in the project gathered on Tuesday, June 14, to celebrate the ambitious effort, which saw project officials invest thousands of hours in building trust with local citizens, communities, and federal and state agencies. Amazingly, every bit of hydropower energy production lost at the removed dams will be replaced by upgrades at six other existing dams in the basin. The Penobscot Trust – an independent group that included Trout Unlimited, other conservation groups and the Penobscot Indian Nation – purchased the three dams in 2010. Great Works Dam was removed in 2012 and Veazie Dam was removed in 2013. Howland Dam was decommissioned, with a fish bypass finished in early 2016. Combined with additional fish passage enhancements at four other dams owned by Black Bear Hydro, the project will significantly improve access to nearly 1,000 miles of habitat for sea-run fish. The effort spanned the administrations of Presidents George W. Bush and Barack Obama, with federal funds a critical element of the $65 million raised to complete the work. Multiple members of the Maine congressional delegation, led by Senators Susan Collins, Angus King, and former Sen. Olympia Snowe, provided vital support for federal appropriations. This impressive collaborative effort is already paying dividends. The Maine Department of Marine Resources releases weekly reports of sea-run fish at a new fish lift at Milford Dam, now the lowermost dam on the river. So far in 2016, the counts have been encouraging. Through June 6, 1,772 American shad were counted, and the river herring count was 1.2 million. In short, millions of herring, thousands of shad and the first few striped bass have already reached parts of the river that have not been open since 1834. 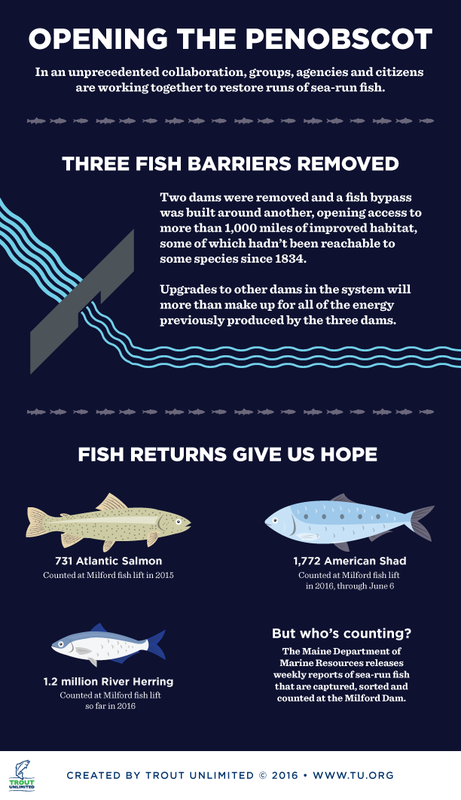 Hundreds of Atlantic salmon have entered the Penobscot since the Veazie and Great Works dams were removed, and now face three fewer dams that complicate their migration. There is reason for celebration, indeed. Thank you, people of Maine, for the world’s best river restoration project. Steve Moyer is Trout Unlimited’s Vice President for Government Affairs. He has been involved with TU’s efforts as part of the Penobscot River restoration effort since the beginning.